Argyle socks. Beatty always wore argyle socks. Couldn’t understand what in the world he saw in them. Didn’t really care. Everything was perfect in those days. Father took care of us the best he could. Gave us food, shelter, and clothes. He, of course, was the one who gave Beatty his argyle socks. I wasn’t jealous though. Jealousy would mean that I was lacking something, and I wasn’t. Khaki pants and polo shirts lined my drawer. Love letters from my girlfriend were discretely tucked into the back corner. Maybe Beatty knew they were there, but he didn’t seem to care. Never said anything about them anyways. Our relationship was more of the ‘mind your own’ kind. People always said we looked exactly alike, and it was so hard to tell us apart. Quizzical expressions crossed their faces when, in response, we lifted our pant legs and showed them our socks. “Really?” I would ask. 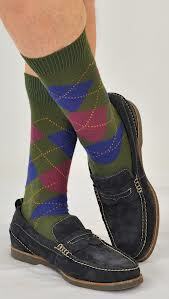 “Surely, I would never wear argyle socks.” Together we would laugh at our own private joke and skip away. Until one day, many years later, when it wasn’t funny anymore. Victoria, my then girlfriend and now wife, called me at the office. “You sure it’s him?” I asked, completely in denial.